CND Signs in Austin can handle even the largest sign job for your company. Our team works with you from design concept to installation and beyond to ensure your sign is manufactured and delivered on time and within your budget. From small store front signs to large standalone pole and pylon signs we are known for our full service signage and installation services. All of our signs carry a one year warranty and we also offer maintenance programs to help keep your signs looking and working great. What Makes CND Signs Different? At CND signs you are assigned a team leader who oversees the entire process of design, fabrication, and installation. Your team leader will help you with your design concept and bring it to life. Your team leader also surveys the location of your sign and obtains any permits for you. Our fabrication team manufactures and assembles your sign in our Austin, TX facility. All of our work is done in house and with US materials when possible. Our professional installation team places your sign quickly and safely. We are with you from step one and after your sign is installed. It is this personal service and dedication to quality which sets us apart from other sign companies. At CND Signs we have access to a 110 foot crane. 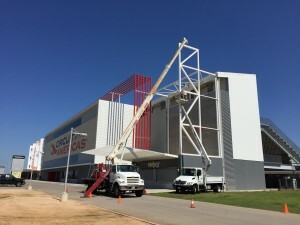 This means we can install even the largest sign safely and within your budget. Our installation team is trained specifically to handle large signs and all of our signs carry a one year warranty. Pole signs pose a special challenge. Large store front signs and standalone signs are also a challenge for some companies, but not for us. Your team leader will survey the site and communicate with the design team, we will obtain all the necessary permits, and work with the installation team to ensure your sign is installed correctly and to your satisfaction. We work with businesses of all sizes from the small mom and pop store on the corner to large corporations. Contact us today and ask about our complete signage package for your business. Remember no job is too big or too small for CND Signs.